The EDGE tax credit program is a critical local economic development tool that incentivizes job creation, growth and competitiveness in the state. The new law extends the program until June 30, 2022. Among the key components in the EDGE tax credit overhaul is that incentives will encourage companies to expand or move to underserved areas in the state, and eligibility thresholds will be lowered to allow more small businesses to grow in Illinois. The overhaul also implements a Gov. Rauner transparency measure, requiring all EDGE agreements be posted within 10 days of the project being secured in Illinois. 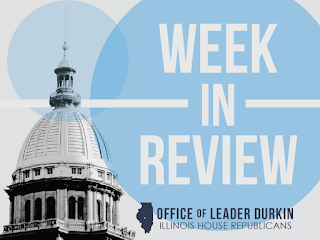 "Enacting these incentives makes Illinois significantly more competitive with neighboring states in attracting and retaining good-paying jobs for Illinois families," said Rep. Keith Wheeler. "This is the type of bipartisan achievement everyone can be proud of." August unemployment rate increases slightly. The Illinois Department of Employment Security (IDES) announced last week that the unemployment rate increased +0.2 percentage points to 5.0 percent in August and nonfarm payrolls decreased by -3,700 jobs over-the-month, based on preliminary data provided by the U.S. Bureau of Labor Statistics (BLS) and released by IDES. July job growth was revised down to show an increase of +600 jobs rather than the preliminary estimate of +2,100 jobs. August’s monthly payroll drop kept over-the-year job growth well below the national average. While Illinois job growth has had its ups and downs since the beginning of the year, the 3-month trend shows average monthly gains of 1,100 jobs per month from June to August, while the six-month trend shows a -100 per month average job loss from March to August. “Illinois is working tirelessly to highlight our strongest assets – our strategic location and dedicated workforce – to bring more opportunity, competition and good paying jobs to our state,” said Illinois Department of Commerce and Economic Opportunity Director Sean McCarthy. “We need to couple that with lasting reforms and incentives to attract businesses and quality jobs in Illinois." The state’s unemployment rate is +0.6 percentage points higher than the national unemployment rate reported for August 2017, which increased to 4.4 percent. The Illinois unemployment rate is down -0.8 percentage points from a year ago when it was 5.8 percent. At 5.0 percent, the Illinois jobless rate stands -0.7 percentage points lower than January 2017. Corn and beans harvest begins. The process of harvesting Illinois farmland has been slowed down this year due to relatively high levels of rain earlier in the season and related moisture levels in the crop. Farmers carefully test the moisture levels of the corn that they bring in, as damp corn will require supplemental drying at added cost. In some cases, a farmer will cut windrows around the standing crop so as to “let air in” and promote natural drying. This begins the harvest while most of the corn remains in the field. As of Friday, September 15, the U.S. Department of Agriculture was reporting that 2% of the corn crop has been harvested, down from the average of 6% that has typically been harvested in Illinois by mid-September. Farmers are optimistic with regards to 2017 crop yields. Illinois corn fields are projected to average 189 bushels per acre, with bean fields yielding 58 bushels an acre. The 2017 Illinois corn harvest is expected to be 2.07 billion bushels, and 600 million bushels of soybeans are expected to be harvested. While corn volume is projected to be down approximately 8% from the 2016 Illinois crop, this is entirely due to a decline in acres planted. Soybeans are starting to yellow out across Illinois, and the bean harvest typically follows the corn harvest. House Republican measure aims to save lives of endangered companion animals. The measure, sponsored by State Rep. Ryan Spain, grants standing to law enforcement for the confiscation and rescue of animals in the possession of someone who has been arrested for putting on a dogfight, or confining an animal in an overheated motor vehicle. Until now, although people could be arrested for the violation of laws forbidding certain forms of animal entertainments or for confining an animal in a motor vehicle, the law did not clearly give law enforcement the right to take possession of animals whose lives are endangered by this conduct. The House approved HB 2810 unanimously and it was signed into law on Friday, September 15 as P.A. 100-504. Child car seat safety to be checked at Seat Check events this Saturday. On Seat Check Saturday, certified Child Passenger Safety (CPS) technicians offer training and continuing education to parents in compliance with Illinois child seat safety laws. Seat Check Saturday is the focus of Child Passenger Safety Week, which is observed on September 17 through September 23. Many parents are confused or overwhelmed by recommendations that they frequently switch over their child’s car seat as the child grows in size. Babies and young children must be securely fastened in a child safety seat whenever they are in a parked or moving motor vehicle, and the safety seat must be closely aligned to the size of its occupant. The car seat must be installed properly within the car or light truck. “Buckle Up Illinois” offers guidance on the proper installation and maintenance of children’s car seats. SBA assistance approved for Stephenson County for July floods. Governor Rauner announced Tuesday that the U.S. Small Business Administration (SBA) approved the state’s request for assistance to help people and businesses in northwestern Illinois recover from severe storms and floods that occurred in July. People and businesses in Stephenson and the contiguous Illinois counties of Carroll, Jo Daviess, Ogle and Winnebago who were impacted by the flooding are now eligible to apply for low-interest, long-term loans. “This assistance will help many people and businesses begin the next phase of their recovery from this disaster,” Gov. Rauner said. To be eligible for an SBA declaration, at least 25 homes and/or businesses in a county must sustain major, uninsured losses of 40 percent or more. A damage assessment conducted in August identified 112 homes, six businesses and one non-profit entity in Stephenson County sustained major damages and had uninsured losses. For more information, contact SBA’s Disaster Assistance Customer Service Center by calling (800) 659-2955, emailing disastercustomerservice@sba.gov, or visiting SBA’s Web site at http://www.sba.gov/disaster. Deaf and hard-of-hearing individuals may call (800)877-8339. Applicants may also apply online using the Electronic Loan Application (ELA) via SBA’s secure Web site at https://disasterloan.sba.gov/ela. Illinois EPA website shows where household hazardous medications can be safely disposed. The Illinois Environmental Protection Agency (IEPA) oversees the disposition of chemical wastes throughout Illinois. Household medications are of special interest because they are widely distributed to consumers. In addition, familiar medications can cause problems for the environment when they are allowed to enter the public wastewater stream rather than being disposed of safely. The IEPA urges all Illinois residents to turn in unneeded medications rather than disposing of them as garbage or flushing them down a stream of wastewater. Their hazardous waste disposal website contains a checkoff box for residents to find a safe medication disposal location that is convenient to them. Governor Rauner enacts civil asset forfeiture reform to protect Illinois residents from unjust property forfeiture. Gov. Bruce Rauner signed HB 303 this week, bipartisan legislation aimed at reforming Illinois’ asset forfeiture system. The reforms will increase transparency and shift burdens of proof to protect innocent citizens while maintaining the proper use of asset forfeiture as a tool for law enforcement. Gov. Rauner was joined by Illinois State Police (ISP) officials, ACLU members, legislators, and advocate organizations. HB 303 also shifts the burden of proving guilt to the government, and increases the burden of proof to mirror that of the federal government in forfeiture cases from probable cause to a preponderance of the evidence, a fair and equitable standard. It also makes a number of other changes such as eliminating restrictive bonding requirements and adjusting the threshold amounts of money subject to forfeiture as well as the levels of cannabis and controlled substance possession that can lead to forfeiture proceedings as a way to thoughtfully limit the use of this system to its intended purposes. Controversy grows over soda pop tax. The levy, adopted by the Cook County Board upon buyers of sweetened beverages, imposes an additional burden upon consumers in Illinois’ most- populated county. While other jurisdictions have also imposed the unpopular tax, Cook County is by far the largest to do so. The more than 5.2 million people who live within county lines must pay an additional tax whenever they buy most forms of sweetened beverages. The tax, which took effect on August 2, is sparking growing protests. 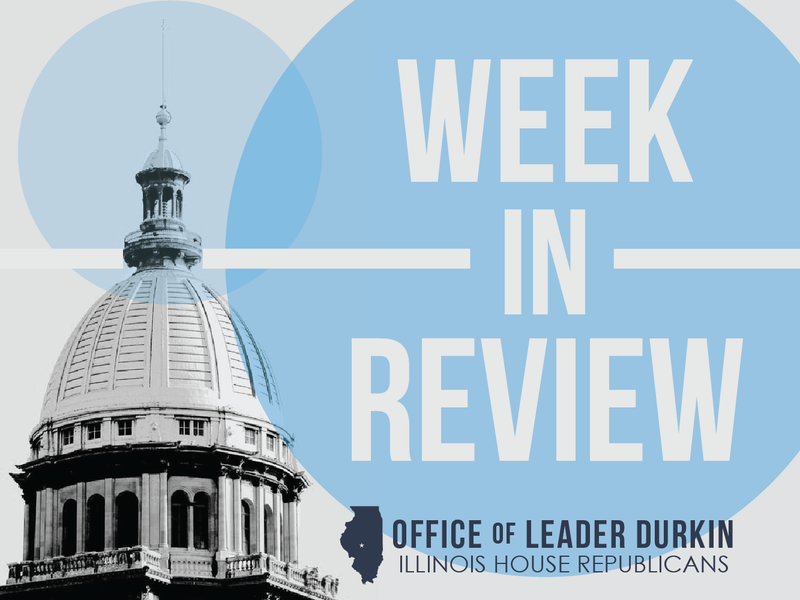 Representative Michael McAuliffe has taken the lead in opposition, sponsoring HB 4082, the first bill introduced in the Illinois General Assembly to repeal the “soda pop tax” and forbid the enactment of any such tax in the future. The Cook County Board, which is controlled by Chicago Democrats, has delayed a vote to repeal the tax. Critics of the tax have drawn attention to inconsistencies in its implementation. While the tax is described as a “sin tax” upon sugared drinks, it is also imposed upon diet soda pop beverages that have no sugar at all. The levy is imposed upon non-exempt beverages at a flat rate that is levied independently of how much sugar or sweetener is in the drink. As a result, buyers of highly sweetened cranberry juice pay the same one-penny-per-ounce rate as the purchaser of a Diet Coke. Furthermore, the list of exempt beverages includes some beverages sweetened with sugars, including sweetened milk beverages such as chocolate milk. IEMA awards $500,000 in grants to 32 county emergency management agencies. The Illinois Emergency Management Agency (IEMA) has awarded a total of $500,000 in grants to 32 county emergency management agencies to enhance their emergency operations centers. "Emergency Operations Centers are the nerve center for coordinating emergency response efforts," said IEMA Director James K. Joseph. "We focused these grant awards on counties that most needed basic technology and other equipment to help them serve their residents during emergencies." To be considered for a grant, an emergency management agency was required to be compliant with National Incident Management System requirements, have a current, approved emergency operations plan, and have a functional emergency operations center. Forty-seven emergency management agencies submitted grant applications, which were competitively evaluated by state and local public safety representatives with priority given to counties with the greatest need. Representatives of county and municipal emergency management also provided input on the eligible items list in order to best benefit county emergency management agencies. Items eligible for purchase with the grant funds include PCs, laptops, projectors, printers, phones, radio base stations, portable projectors, screens, white boards and furniture for the emergency operations center.